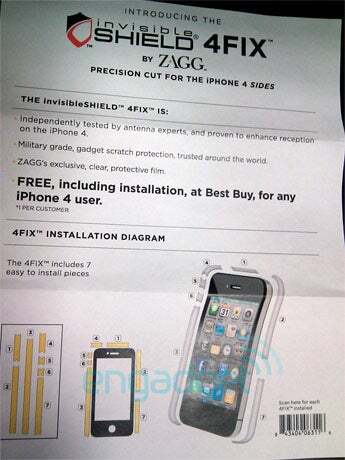 Best Buy Giving Free invisibleSHIELDS To Unhappy iPhone 4 Owners? This program will be available free of charge, including installation, to anyone who purchased or will purchase an iPhone 4 from Best Buy and will be extended to all existing Reward Zone customers. The solution will also be available to the general public for the retail price $9.99, including installation. The free invisibleSHIELD offer lasts until August 7th. In addition, anyone can get 20% off iPhone 4 cases at Best Buy until then too.